France has likely the world’s most revered culinary tradition. It is country where just about everyone appreciates quality food and where bakeries, bistros and fine restaurants abound. 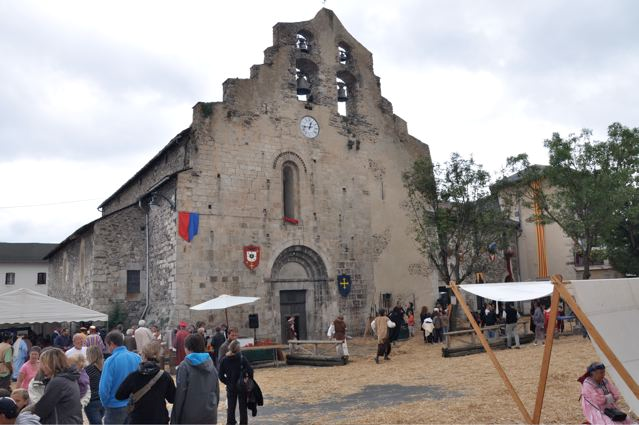 Thus, it must have come as a bit of a surprise when Lewisville, North Carolina resident Cap Anderson stumbled upon the following scene during a recent visit to Villeneuve de Formigueres in the French Pyrenees near the border with Spain. 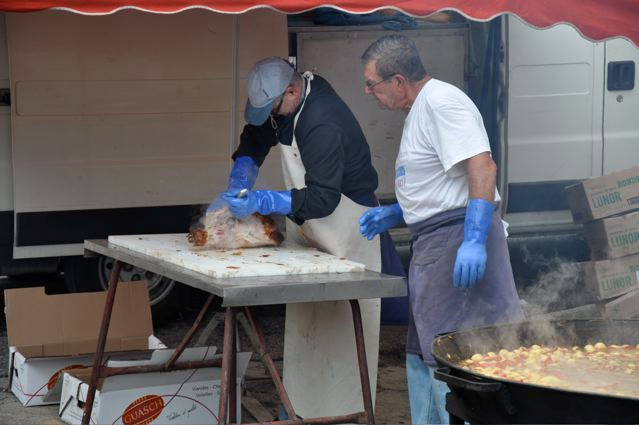 According to Anderson, “The village was having a medieval festival featuring, you guessed it…pig.” As shown above pork was cooked on a spit over coals laid right on the ground. Not too dissimilar for early American barbecue. And what was the side dish offered with the pork? 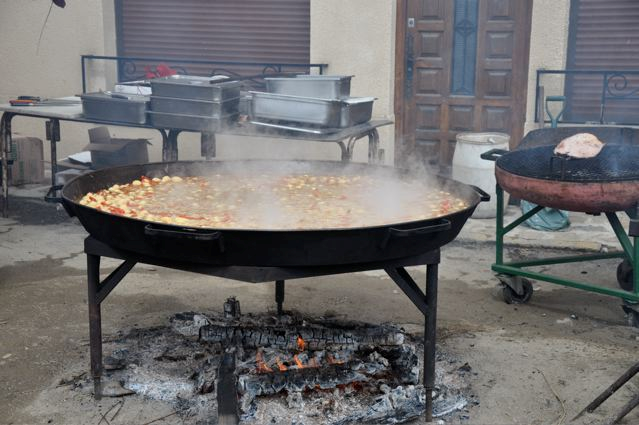 A stew of “potatoes, beans, onions, tomatoes from what I could see,” reports Anderson. How do you say “Brunswick stew” en francais? Sorry, Virginia, Brunswick stew was invented in France. Back to the pig. 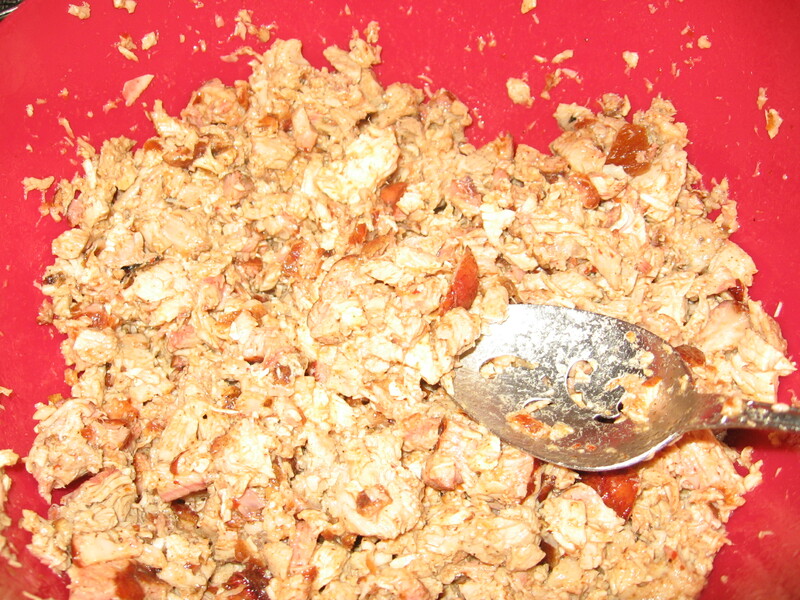 After it was cooked, the pork was pulled and sliced and placed on small grills to finish. See more of Cap Anderson’s photos below. And for any of you Freedom Fry-Focuses Francophobes, it looks like you need to give the French another chance! 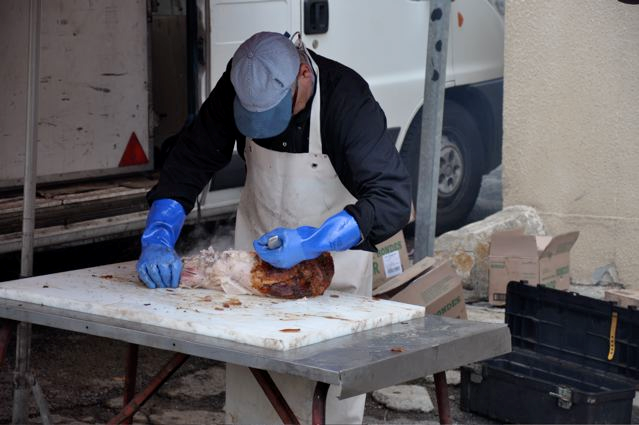 Plus, French cooks have long been known for their use of virtually every part of the animals they cook, so perhaps there is a natural kinship between North Carolina’s whole hog barbecue traditions and those of the French. Vive la France indeed. Here’s hoping your July 4th cookout was less pathetic than this tech geeky one. I guess there really is an app for everything, but I think your hog-tech gadget budget would be better spent on this pork-based iPhone stylus. 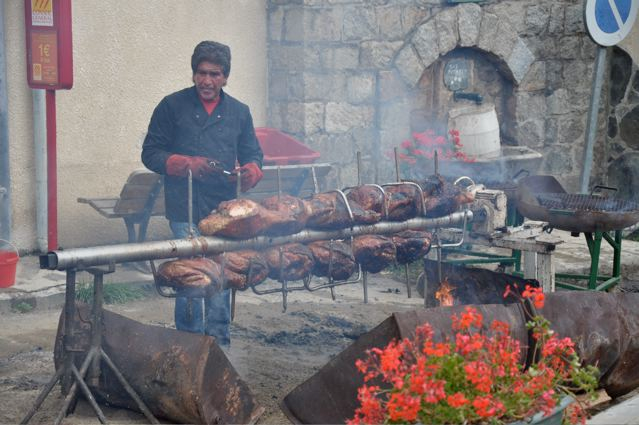 Porky’s Pulpit: Were There BBQ Joints in Nazareth? Thank you to Jay and Katherine, a husband-and-wife team who sent me the below picture of a fascinating tapestry. According to Katherine, “The tapestry hangs in the Gallery of Tapestries in the Vatican Museum and is a picture of the Last Supper. I think it was woven in the 1600s.” Why is this artwork of particular interest, other than the obvious fact that it is Holy Week? Well, this particular depiction of the Last Supper appears to feature a serving platter full of pig! Since I’ve never before seen a pig-positive depiction of the Last Supper, I’m curious to hear from any religious scholars who can help answer these questions: Are those really pigs featured on the platter? And, if so, is it at all possible that swine might have been on the menu at the Last Supper given the number of, you know, Jews present? 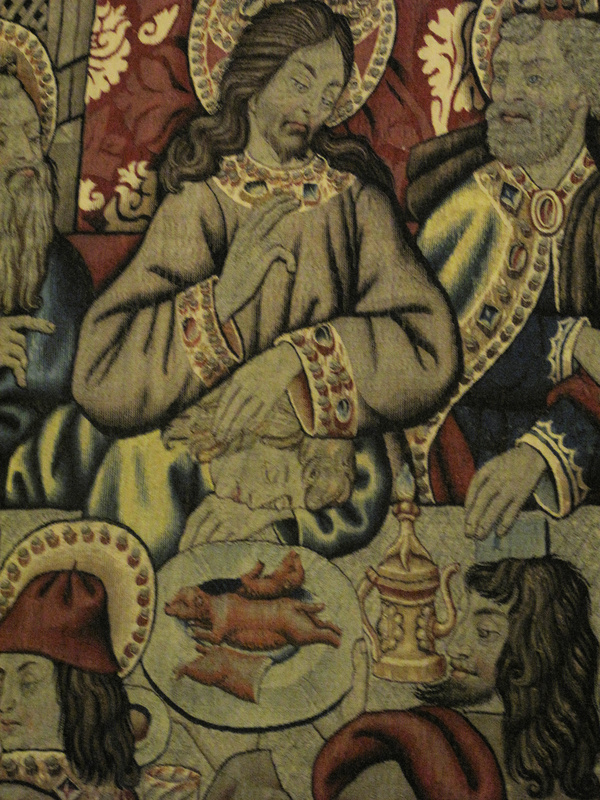 Also, what might the pigs’ symbolic meaning, if any, be in this tapestry? Given Jesus was a Jew, one would expect he kept kosher. Then again Jesus, you may have heard, was no ordinary Jew. According to that holiest of holy website WikiAnswers, which is a decidely unscholarly source of information, there is some debate about whether Jesus indulged in treyf food like swine. The evidence that Jesus might have eaten pork largely comes from him saying, “It is not what enters into the mouth that defiles the man, but what proceeds out of the mouth, this defiles the man” (Matthew 15:11). Whether this one passage can be interpreted to mean it is okay to eat pork and other “unclean” foods is not clear. Anyone out there care to enlighten me? Pork: The Viagra of Meat? The beef-crazy people of Argentina, who on average consume more than their body weight in beef each year, are faced with a national shortage of the red meat. Their fearless leader is encouraging them to try an alternative: pork. If the above quote had been made by a U.S. politician, Pfizer, the parent company of Viagra, would have already filed a lawsuit for slander. Of course, no U.S. politician would dare challenge the pharmaceutical industy so it’s a moot point. At any rate, if Valentine’s Day was not enough to put the romance back into your life, then maybe you should learn from the good people of Argentina. The world's most delicious aphrodisiac? The obvious question is, “Do they have double entendres in Canada?” I’ll let our legions of Canadian readers write in to answer that question. At any rate, Eric, thanks for alerting me to this sign and allowing me to embargo it for months before sharing it. It certainly captures the spirit of Valentine’s Day. Today marks the debut of an occasional feature called BBQ in the News, in which we share ‘cue related stories that come from near and far, and range from unimportant to not that important. Enjoy. The Grinch Who Stole the Birthday Brisket – This story comes from Houma, Louisiana courtesy of The Daily Comet, which I think may be the paper Clark Kent worked at before moving up to The Daily Planet. This sad story begins with Jonathon Pepper buying his wife Brandi a brisket for her birthday. (That’s the gift that keeps on giving, Clark.) Unfortunately, after 2 days of marinating, the brisket was stolen from the couple’s smoker while it cooked. “I would honestly like to know who steals someone else’s barbecue in their backyard,” bemoaned Mrs. Pepper. My theory: Mrs. Pepper herself, in a fit of rage that her husband bought her brisket instead of a pork shoulder. Free New Year’s BBQ in Fayetteville – According to the Fayetteville Observer, “The public is invited to a free feast of barbecue, collard greens, sweet potatoes and black-eyed peas on New Year’s Day.” Need I say more? Get thee to Cumberland County! The Barbecue Gazebo – Okay, technically this is not a news item. Still, did you know that you can purchase a “barbecue gazebo” from your good friends at Hammacher Schlemmer for less than $1,000 plus shipping? Well, actually, the website says this item is no longer available. Oh well, in that case I won’t mock it. Barbecue Fork Involved in Stabbing – According to Australia’s AdelaideNow, “TWO men spent their Rudd Government stimulus packages on drugs before one viciously stabbed the other in an argument over sugar.” The article is very choppy and difficult to understand–as if the reporter was also using drugs–but it sounds like the meth using stabbing victim wielded a barbecue fork, while the meth using stabber wielded a knife. Knife trumps fork. Lexington Barbecue Tourism – According to The Dispatch, the slightly more than one year-old Lexington Visitor’s Center has been an asset to the local economy, in no small part due to its promotion of barbecue-related tourism. More than 3,300 visitors have come through the doors since the Center opened on December 1, 2008.